Does the busy modern world have you wishing you could step back in time? We’re happy to say your wish has been granted with this trip down memory lane (or highway)! Climb aboard our BC Road Trip Time Machine and travel Vancouver Island Highways 1 and 19 (between Duncan and Kelsey Bay) as they were in the spring of 1966. It’s a long drive, so we have broken the video up into three sections for you: Duncan to Parksville, Parksville to Campbell River and Campbell River to Kelsey Bay. Countless side road intersections have been improved with traffic lights and turning lanes, as well as acceleration and deceleration lanes, to keep travellers safe. Rumble strips and reflectors have been installed along sections of both highways to improve safety. Roadside clearing or “brushing” have improved sight lines on both highways. Median and roadside barriers have been placed along both highways. Check out the “Next Generation” of highway barrier located in Nanoose. Road-level railway crossings have been realigned. Traffic volumes have increased dramatically in the years since this video was taken! Old Howe Truss bridges along the route have been replaced to allow larger vehicles to travel the routes. In 1992, the Vancouver Island Highway Project began, which when completed in 2002, created a new 4 lane divided highway between Nanaimo and Campbell River, now known as Highway 19. The existing Highway 19 was renamed to Highway 19A, the ‘Oceanside Route’, or the ‘Old Island Highway’, depending on who you ask! Many stretches of BC Highway 1 are now four lanes wide. The current alignment of Highway 19A though Courtenay bypasses the downtown core and the old 5th Street Bridge (seen here as it existed in 1966). Kelsey Bay used to be the end of the line for BC Highway 19 in 1966 where BC Ferries originally began its northern route to Prince Rupert. It wouldn’t be until 1978 that Highway 19 travelled from Campbell River to Port Hardy. The Inland Island Highway (now called BC Highway 19) now travels outside the City of Nanaimo, rather than through it. It connects back up with the original alignment near Lantzville. There was no Inland Island Highway, therefore no local Inland Island Highway connectors. If you’ve been riding along with us, you’ll know we’ve toured many other parts of the province in our BC Road Trip Time Machine travels. 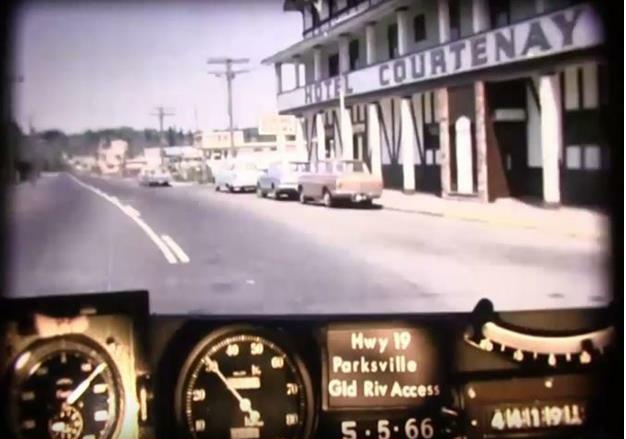 We recorded these nostalgic videos from 16mm film footage taken in 1966. The original photologs were collected by rigging a camera onto the dash of a car that took still images every 80 feet or so and then running those together as a single film in order to create a visual record of road condition information from across the province. This allowed our engineers to study a stretch of road without having to travel there. Pretty cool stuff, huh? Vancouver Island has done a lot of growing up since 1966 to be sure. Did you notice anything else that has changed or have a question or comment? Let us know below. Time for you to start painting the “Keep BC green, use your ashtray.” signs on the actual roads again. These road trip time machine films are great! I wonder if the original intent was to use them as a slide show rather than a movie? Would there be some way of taking the individual frames and integrating them into Google streetview or maybe as a layer in Google Earth? If it could be added to streetview, it would be much easier to move back and forth through the pictures. Thanks for your comment. The movies were created by taking individual photos every 80 feet or so and then processing them all together on one 35mm film reel. We try to capture stills and share them on our Flickr site, when we can. Unfortunately, some frames present “ghosting” of things captured just outside the individual cells, and try as we might, we can’t capture them. You can slow down the video speed on YouTube. If you look to the bottom right hand of the video screen, you will see a gear icon. Select playback speed and choose from there. FYI these videos were created to be viewed as films. We’ve heard that each engineering branch across the province had a machine to view the videos and stop on areas of interest. Hope this information is helpful. If you have any other questions or concerns, let us know. Having recently moved to Courtenay from my home of 60 years in Victoria, this was so very interesting. As a child, my parents never ventured further than Qualicum Beach, so it was very interesting to see some of the old buildings still standing around Royston that are depicted here. My only wish is that the trip had been a little slower, I’d loved to have revisited some of the old Duncan, Ladysmith etc. buildings that we whizz by, a little closer. Thanks so much for the memories! Thanks for the comment CJ. We love hearing from people about these videos. Would you believe that these videos have been slowed down to 30 percent of their original speed? Talk about whizzing by! You can slow down the video on the YouTube screen. If you hover over the gear icon on the bottom right section of the screen showing the video, you can select settings and change the speed that way. Hope that this helps! What memories! Surprising how much of the old landscape hasn’t changed that much. Would be great to do this again for future generations. Glad to hear you like it Jack – thanks for the feedback! I enjoyed the trip. Can you tell me the name of the gas station at Cassidy, just before Hemsley Creek? I can’t read the sign. I know its not Esso. We can’t quite make it out either Steve. Perhaps it was a Ma and Pa station? Wow! My family lived in Sayward 1956 or so to 1972, and boy do I remember that highway. I was 7 when we moved to Campbell River but we frequently went to Sayward, even after moving to Victoria in 1974. The double-hill around 10 miles north of CR: a little hill, a small level spot and then a sharper descent, followed immediately by a left turn. Q: About the Salmon River bridge closest to the village) with its high bridge – it looked like a mountain to this little girl. Is there any record of how high the high wooden bridge actually was? These are great. A real flashback for those of us who drove the highway in the ’60s. I love it. Somewhere there is one film of Victoria to Duncan over the Malahat as well when it was only two lanes and not a lot of traffic. Can you post that one please? This brought back the memory of the trip out to the Comox Valley in 1967. That being the year my family moved here. I remember the slow drive and I do mean slow but after Naniamo we landed at my Aunts Beach resort in Lantzville and the first time I touched an ocean. Compared to now even the lower road seems like a goat trail. Thks for the memories. Glad to hear you liked it Joe and that it brought back some nice memories! This is AMAZING… so cool to witness… truly a historical moment!! Thanks so much for providing this!! We are so happy to hear you enjoyed it. Where could I find out the daily traffic levels (by hour) on the Inland Island Hwy. (between the Kaye Rd. junction and Exit 51 onto Alberni Hwy?). I’ve looked all over and cannot learn about this traffic flow information. The amount of vehicle traffic through the day there has been recorded, (I’ve seen the traffic-counter boxes along side the Hwy). I need to know this for real estate information to clients wishing to buy property along that route. People always ask how busy that Hwy. is, when looking at homes in that region. Housing developments built all along; Coldwater Rd., Wildgreen Way, and Fourneau Way, require this info. for potential buyers. Please reply with how I can receive this. Thank you. Thanks for connecting with us. If this in our jurisdiction (it might be a municipal), please contact our local area office for more info: 3rd floor – 2100 Labieux Rd. I have dreamed of having a time machine to visit the area between Parksville and Courtenay since we moved to the Island in Bowser in 2005. In 1996 my family came to the Island for a vacation from Calgary. From Departure Bay in Nanaimo we drove to Parksville and then to Uculet. In 1970 and ’71 I came back to the Island as a summer student to work in a research camp outside Courtenay. In 1971 a buddy and I took the train on Friday from Courtenay to Victoira and cycled back on Sunday for work on Monday. Two main observations . . . there were a lot of gas stations then and there were more trees but they were smaller than they are now. Funny thing is I want to pause the video and drag the image for lateral views. It just won’t work. These images are so exciting. I’m grateful to be able to view them. We are so glad to hear that you enjoy these videos. We love them too and we always look forward to hearing back from people with a keen interest in looking back at our highway history. Safe travels. I really enjoyed watching these videos. It is interesting to see that the road itself has changed very little except for the obvious added lanes and real estate. And the traffic or lack of..lol The video I really enjoyed was the Campbell River to Kelsey Bay. I live in Sayward now and that road has really changed. And all the bunk houses etc. are now gone from Kelsey Bay. Thanks for sharing. We are glad that you enjoyed. We enjoy sharing them! The huge power station just north of Duncan hadn’t been built yet but the site was being cleared. Inspiring road markings: Keep BC beautiful. Use your ashtray! We noticed that marking too and will be sharing it out as well very soon now that wildfire season is upon us. Thanks for connecting with us here! Keep BC *green*. (As in, don’t make it black by burning it down.) Use your ashtray. We bought a home in Qualicm Bay 1956. My parents drove us to the cottage every summer 56’to 70. I loved these old pics I think I have some of mom’s old 8mm movies of the same routes. Wow reminds me of my childhood in the early 60es!!! Thanks for letting us know. We have shared your comment forward to the local area manager.